A woman has had surgery to remove 7lbs (3.2kg) of excess skin after she lost a staggering 303lbs (137.4kg). Lexi Reed, 27, from Terre Haute, Indiana, who used to weigh 490lbs (222.2kg), was left with severe folds of loose skin after she shed more than half her body weight. Mrs Reed would be left in tears after battling agonising pain in her jaw, back and neck, which doctors put down to sinus pain related to a root canal. It was not until her husband Danny, 30, lifted up the excess skin on Mrs Reed's front last September that she finally felt relief. A doctor later revealed the weight of Mrs Reed's excess skin was pulling her body out of its natural posture. Mrs Reed is now finally enjoying having a flat stomach after undergoing nine-hour surgery to remove the excess skin from her abdomen, thighs and buttocks. Speaking of her discomfort, Mrs Reed said: 'I suffered months of pain, taking four or five antibiotics and was told it may even be a sinus infection. 'But I knew my body and the way I felt wasn't normal, the bizarre symptoms weren't adding up. 'A few times I wondered if I would wake up the next day as no one knew what was wrong with me. 'It wasn't until standing in front of the mirror that we figured it out, some days I would stand there crying to Danny not knowing what was wrong with me. Mrs Reed's husband lifted up the excess skin on her front, which instantly relieved the strain on her neck. 'It was then that we came to the realisation that it was my skin that was causing me pain,' she said. The couple reached out to consultant Dr Joseph Michaels, who confirmed her excess skin was likely to blame and recommended surgery to remove it. Although still recovering, Mrs Reed believes the ordeal of surgery, which cost $17,000 (£13,060), will be worth it. 'While I'm still in pain from the surgery right now I don't have my stomach holding me back and the pain being gone from my neck will be a new life and make it worth it,' she said. Despite having the surgery to remove her loose skin, Mrs Reed insists vanity played no part in her decision and she was actually proud of her 'battle wounds'. 'I knew going into this I would have loose skin,' she said. 'I saw my skin as a battle wound, I knew my body didn't deserve to carry around the weight of all the excess skin. 'I would have preferred to have ten times extra skin than be 485lb and on my death bed, there's so much more I can do now. 'I could fit in a airplane seat, go for walks and so many things, my skin never held me back before. But looking at her abs was a moving moment for Mrs Reed, who still has some loose skin on her legs and arms. 'Seeing my stomach was emotional, I have never had a flat tummy in my entire life,' she said. Mrs Reed started her weight loss journey three years ago, along with Danny who weighed 280lb (127kg) at the time. The pair hoped losing weight would boost their chances of starting a family and even used chants of 'baby Reed' to motivate themselves. At their heaviest, they got through 8,000 calories a day between them. Mrs Reed was always the heavier of the two and even had a BMI of 78.3 - the healthy range is between 18.5 and 24.9. After losing 392lb (177.8kg) between them, Mrs Reed is now a lean 182lb (82.5kg) and her husband 185lb (83.9kg). 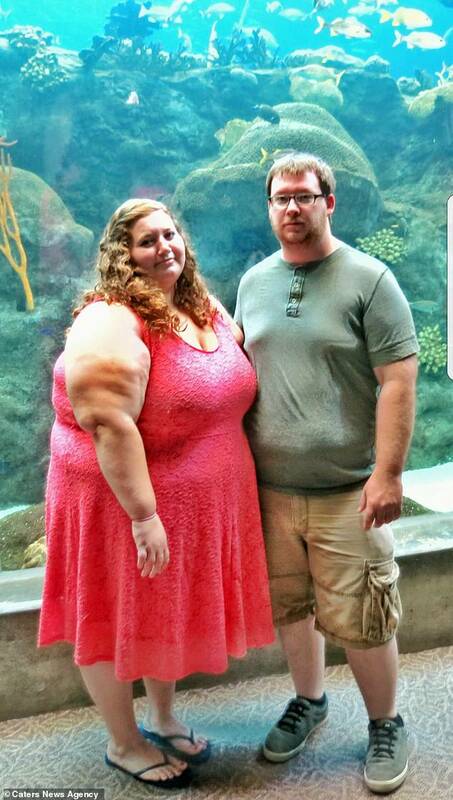 To celebrate their weight loss, the couple embarked on a bucket list of challenges including visiting theme parks, travelling, kayaking and hiking. 'Excess skin can constantly pull on her skeleton and can cause pain in the back, neck and other areas,' he said. 'It's not just the sheer strain but the way it pulls the body and the problems that can cause. 'The skin can be an issue in terms of their hygiene and daily activities, fortunately Lexi is very mobile, but was being caused chronic pain. The skin Dr Michaels' removed was more than 3ft wide and 1.5ft high. He also took some excess fat out of her abdomen and legs via liposuction, which he transferred to her buttocks. 'We don't want patients to look like a pancake on their buttock, we want good shape and good curves,' the board-certified plastic surgeon said. 'I'm very pleased with how the surgery came out and happy that she is reporting improvements with her muscular skeletal pain. 'It's really important for patients to know you can't exercise your skin and for a lot of patients the skin is not only a physical burden but a psychological one too. 'It can really prevent patients from realising the true extent of their weight loss accomplishments but once the skin is removed the physical and emotional improvement is very dramatic.